The U.S. Senate on Wednesday ratified an arms control treaty with Russia that reins in the nuclear weapons that could plunge the world into doomsday, giving President Barack Obama a major foreign policy win in the closing hours of the postelection Congress. The treaty passed 71 to 26, giving it the two-thirds majority needed for ratification. With Vice President Joe Biden presiding over the Senate and Secretary of State Hillary Clinton present on the Senate floor, 13 Republicans broke with their top two leaders to support the package, along with all 58 senators who caucus with the Democrats. Passage of the New START treaty was essentially assured on Tuesday, after 11 Republicans joined Democrats in a vote to end debate on the pact. The approval marks a big comeback for Obama's arm controls efforts after the treaty appeared all but dead just weeks ago. The Obama administration has argued that the United States must show credibility in its improved relations with its former Cold War foe, and the treaty was critical to any rapprochement. The White House is counting on Russia to help pressure Iran over its nuclear ambitions. 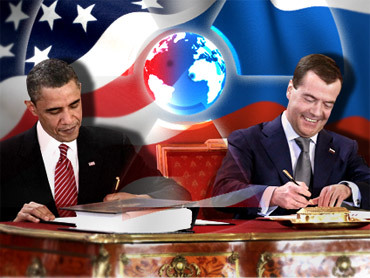 The New START treaty, signed by Obama and Russian President Dmitry Medvedev in April, would limit each country's strategic nuclear warheads to 1,550, down from the current ceiling of 2,200. It also would establish a system for monitoring and verification. U.S. weapons inspections ended last year with the expiration of a 1991 treaty. "START" stands for Strategic Arms Reduction Treaty. "We are on the brink of writing the next chapter in the 40-year history of wrestling with the threat of nuclear weapons," said Foreign Relations Committee Chairman John Kerry, D-Mass. The treaty's ratification marks a third recent major political victory for Obama, even though his Democratic party was trounced in last month's congressional elections. In recent days he won passage of a bipartisan tax deal and a vote ending the ban on gays openly serving in the military. The president is holding a press conference today to address the latest congressional achievements. The administration was adamant that the treaty be ratified this year because the Democrats' majority in the Senate is set to shrink by five in January and waiting could have meant months of delay or defeat. Republicans accused Democrats of rushing approval of the treaty for political reasons. They have asserted it would limit U.S. missile defense options and argued it has insufficient procedures to verify Russia's adherence. When Jon Kyl of Arizona, the leading Republican on negotiations over the treaty, suggested a delay last month, Obama appeared unlikely to find the nine Republican votes needed for passage. But he and top members of his administration lobbied intensely, with Obama postponing his Christmas vacation in Hawaii. They enlisted support from top military officials and big-name Republicans from past administrations who argued the treaty was essential for U.S. national security. In the end, they persuaded enough Republicans to defy the party's top two leaders in the Senate and support the pact. "We know when we've been beaten," Republican Sen. Orrin Hatch of Utah told reporters hours before Tuesday's vote. Even the Senate's No. 3 Republican, Lamar Alexander of Tennessee, endorsed the accord, saying he was assured U.S. defenses would not be weakened. The treaty will leave the United States "with enough nuclear warheads to blow any attacker to kingdom come," Alexander said on the Senate floor. Republicans had tried to kill the treaty by forcing changes in its language that would have sent it back for negotiations with Moscow. Democrats sought to appease some Republican senators by letting them raise these issues in legislation accompanying the treaty that would not directly affect the pact. On Wednesday, two such amendments, one on missile defense and one on funding for the U.S. nuclear arsenal, passed with support from both parties. But most Republicans remained opposed to the treaty. Kyl did manage to win Obama's commitment to modernize the remaining nuclear arsenal with projected spending of $85 billion over 10 years. The treaty vote exposed divisions within the Republican Party that could stretch into the 2012 presidential and congressional elections. Obama got the treaty with the help of several GOP Senate moderates who split with possible White House hopefuls, some of the fiercest critics of the accord. Former Massachusetts Gov. Mitt Romney opposed the pact; Sen. Scott Brown, R-Mass., who faces re-election in 2012, voted for it. Former Alaska Gov. Sarah Palin said the treaty was not in the country's interest; Sen. Lisa Murkowski, R-Alaska, backed it. Former House Speaker Newt Gingrich described it as an "obsolete approach that's a holdover from the Cold War;" Sen. Johnny Isakson, R-Ga., supported it.